2007 – THE YEAR OF THE HARLEQUIN IN WORCESTERSHIRE? Readers are referred to the article in Worcestershire Record November 2006 No 21. 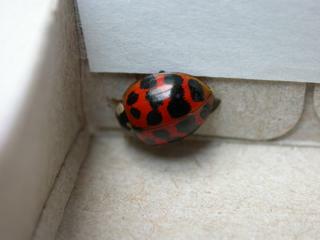 Since that publication several new records have been sent in during the winter of 2006-2007: from Worcester, Malvern, Edgbaston (Birmingham) and Fladbury indicating that Harlequin Ladybirds have successfully hibernated in the county following the great spread NW from the London area in 2006. The map that accompanied this article can be seen on the national recording web site at www.harlequin-survey.org where it is regularly up-dated. You can also submit your records to this national site but if you do please also send them to Worcestershire BRC. The national map shows records from 10x10 km squares, a rather coarse recording unit for county records and we very much wish to keep track of Harlequins in the county. In view of the great expansion of range during 2006 pausing over-winter on the eastern borders of Worcestershire we could see an explosion of records here in 2007. Harlequin ladybirds are relatively easy to identify once you have got your eye in. If you find an odd-looking ladybird about the size of the familiar 7-spot Coccinella 7-punctata or a little larger there is a good chance that it is a Harlequin even though the latter occurs in a wide range of patterns and colours. Two main varieties have appeared in Worcestershire so far. One has mainly orange elytra with around 18 black spots, and the pronotum black with large white spots at times forming a letter W. The other variety found is spectabilis which is mainly black with two large red spots, one on each elytra. Constant features are a marked ledge or lip on the outer margins of the elytra, and tiny horizontal ridges on the rear of the elytra. Ideally we should like to see any specimen found and/or a picture. The national web site requires records to be backed by a picture. When you send records to the Worcestershire BRC we should like to see a specimen of picture if possible. Harlequin ladybird from Fladbury, Worcestershire Harlequin ladybird, form spectabilis. Please see our previous articles in Worcestershire Record and the very useful article by Roy et al 2005. GREEN, H. 2006 Harlequin Ladybird Harmonia axyridis. Worcestershire Record 21:10-11. ROY H, ROWLAND F, BROWN P, WARE W, & MAJERUS M. 2005. 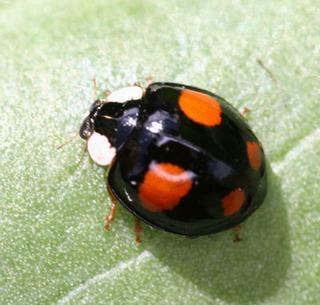 Ecology of the Harlequin Ladybird, a new invasive species. British Wildlife vol 16, No. 6, August 2005, pages403-407.